Lubaline is a contemporary font family that is a great tribute to one of the most famous American graphic designers – Herbert Lubalin. He was one of the most innovative and creative figures in the field of graphic design in the middle of the 20th century. Sometimes referred to as “the rule basher”, his main legacy is his admiration of beauty that was the symbol of his work. Lubalin found beauty where everyone else found only functionality thus influencing the creeds and styles of plenty of designers. One of those designers is the Argentine Maximiliano Sproviero – the creator of Lubaline font family. Lubalin impacted deeply his work with plenty of Sproviero’s fonts being inspired by him. So, paying tribute to Lubalin became essential at one point. This tribute is Lubaline – a great decorative typeface that offers all Herb Lubalin would have liked, mainly the exuberant style, the art-deco letterforms, the lavish flourishes and swashes and ultimately the sensual feeling it creates. 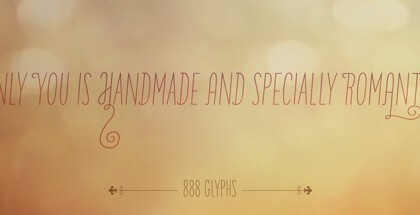 It is safe to say that this typeface sprays magic all around and those who use it will achieve remarkable results that will be unique. In fact, the users can choose from 7 fonts – Lubaline, Shine, Shadow, Shadow Solo, Light, Light Tile, Light Tile Solo, plus a very useful set of extras. All these will work perfectly when combined, creating plenty of opportunities. Lubaline font is highly recommended for projects that aim at catching people’s attention instantly, such as posters, greeting cards, book covers, signage, etc. One particular area where it could be used with great success is the circus related items. 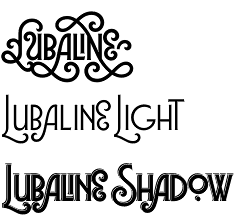 Get Lubaline font family and achieve outstanding results!